I truly enjoyed creating this free printable student binder that I am sharing on the blog today. I dearly and passionately created this planner because I have a soft spot for all the students out there. If you’re wondering why, not a lot of you know that I was a teacher for 8 years before I became a full-time blogger. Essentially, helping students shine has become part of me. My dream for this planner is to be able to reach and inspire thousands of students out there to excel in class! Consider this pretty student planner then as a gift from your teacher friend! I hope you don’t mind me talking a little bit about my life back when I was still a teacher. How I miss those days. It makes me smile right now thinking about how my every day was. Ahhh, the noise of learning! I also remember that back then, I always admired kids with school binders neatly kept. In my own subject, I usually required a porfolio for kids to organize their exams, reading materials and homework. I diligently checked this because I noticed that when kids are organized, they tend to perform better in class. And today, my being a teacher is kicking in again. I passionately created this free printable student binder for all the students in the world to enjoy. Ahhhh, how fulfilling! But really, how I wish I had the luxury of time to create a free printable student binder like this one way back. I can imagine how my students would have happily accomplished the forms. But I know it’s not yet too late though–I have bigger audience this time! I am declaring that this beautiful student planner will reach the hands of millions of students! Help me reach the goal by sharing this post on Facebook or by pinning the images on Pinterest! 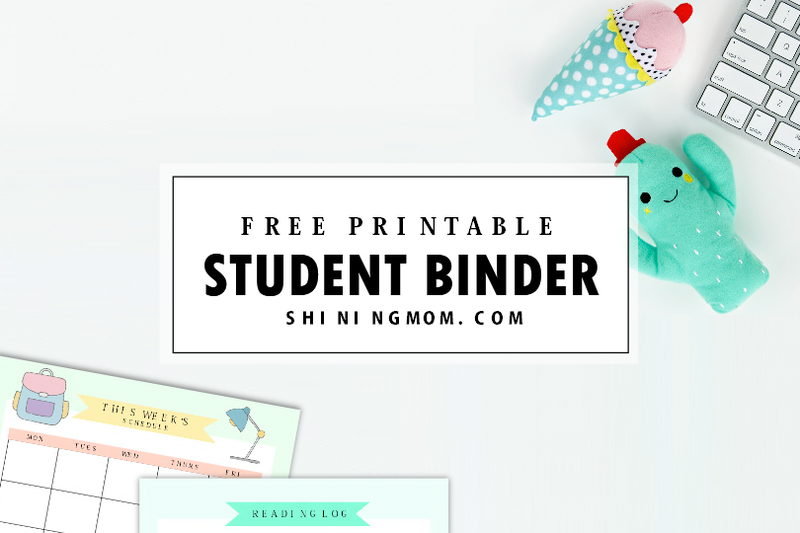 The Free Printable Student Binder: Over 25 Planning Sheets! Depending on the student’s preference, I’ve actually created 4 students binder covers for you to choose from. This binder can be used by lower school, middle school, junior high and even high school and college students! Thanks to DesignCuts for the designing toolkit. Creating this free printable student binder has been easy and so fun for me! Since there are a lot of things to keep track of at school, I made sure to include organizers to help you not miss any. 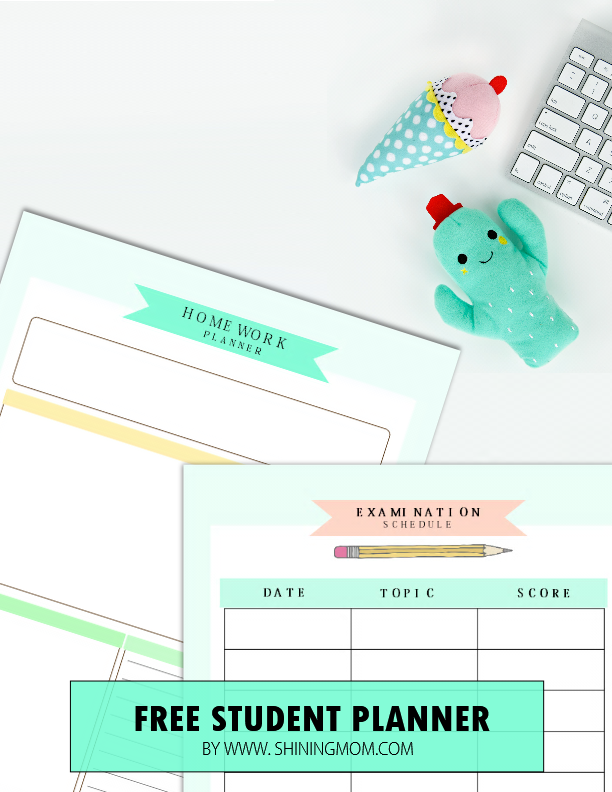 I have included pretty pages to organize your homework, project and examination schedules! To help you have a fruitful day at school every day, I have also included daily and weekly planning pages. These pages are all goals-focused because I believe learning to set goals at a young age will make a big difference! (You know how much I love setting goals, right? There’s an entire post dedicated for this with free printable monthly goal setting pages here!) Start building your future now! School in also about making friends, do you agree? 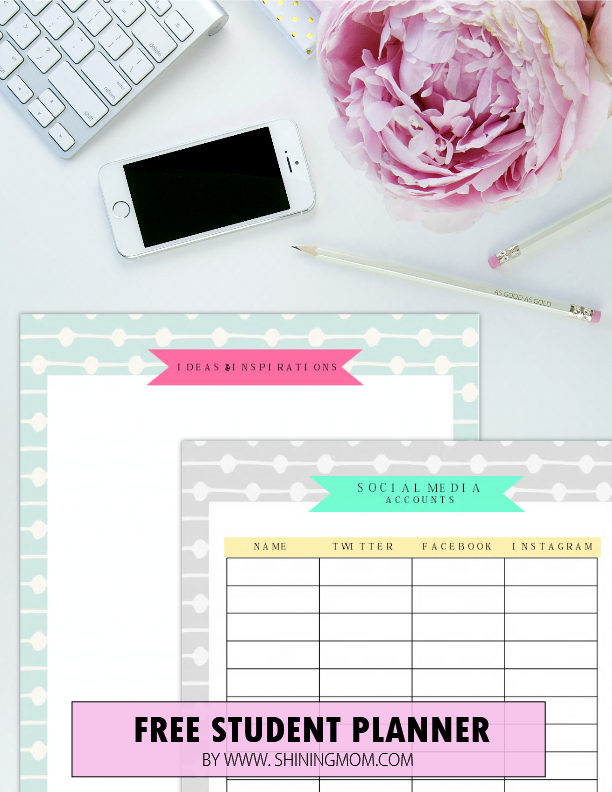 In this free printable school binder, I have also included sheets for you to keep track of your classmates’ birthdays, contact numbers, social media accounts, and more! There are also pages where you can freely spill out your creativity as I have added bonus pages for you to sketch your ideas and inspirations! These are just some of the pages included. There are more organizers to love when you see the entire binder! Did I already say that the pages come in happy and bright colors both the boys and girls will love? And oh, homeschooling mommas, you can definitely print out this binder for your kids to enjoy, too! 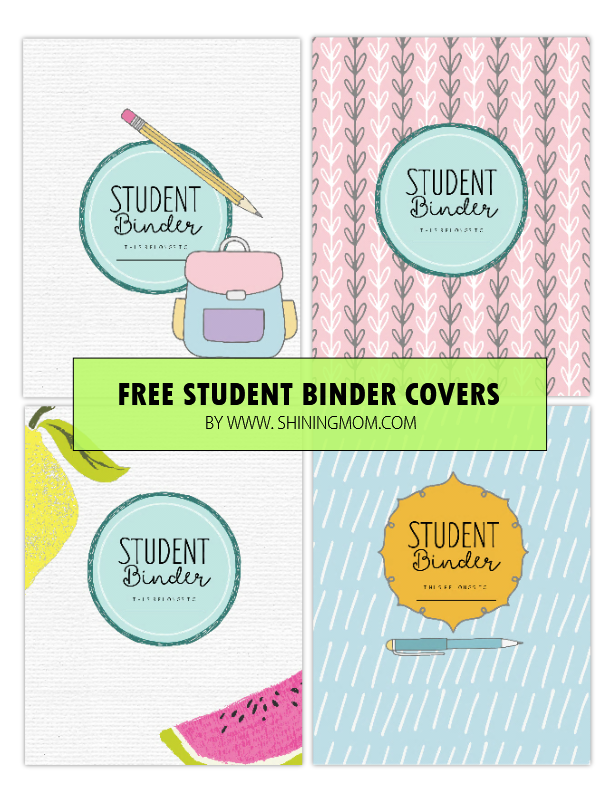 Really, this free printable student binder is great to have. 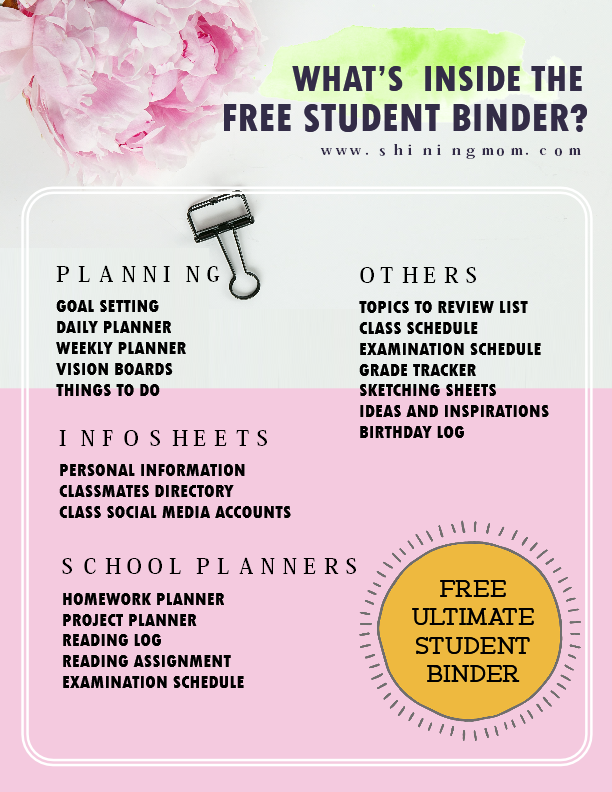 Yup, I think you’ll love this free student planner! I also hope that it reaches the hands of thousands and thousands of students who work very hard for their future. Dear students, this beautiful planner is for you! Go ahead and snag a your free printable student binder pages over HERE and the four binder covers HERE. It’s absolutely free for personal use. The pages are designed to be printed in standard, letter-sized paper. And oh, if you’re looking for a free teacher planner, I have also published one which you can find over HERE. That planner is so popular in Pinterest these days! And if you’re a mom looking for an excellent household binder to use, I also have a planner just for you. Go see the “Every Mom’s Planner” HERE. I think you’ll love it! Additionally, please know that I have also released an ultimate homeschool planner. If you need one, snag the planner HERE! Or, you might like to grab my 20+ FREE back to school organizers! *Update: I have released 2 new student planners that you might also want to see! Do check out the freshly released FREE student binder HERE which has 40+ amazing planning pages designed to ease stress and increase productivity in school! And finally, check out the cute planner for grade school kids HERE! That’s it! I hope you can really use this student binder. It’s a simple one but I believe it can really help you make your school year fun and easy. Have a great day ahead, friends! Loving this freebie? 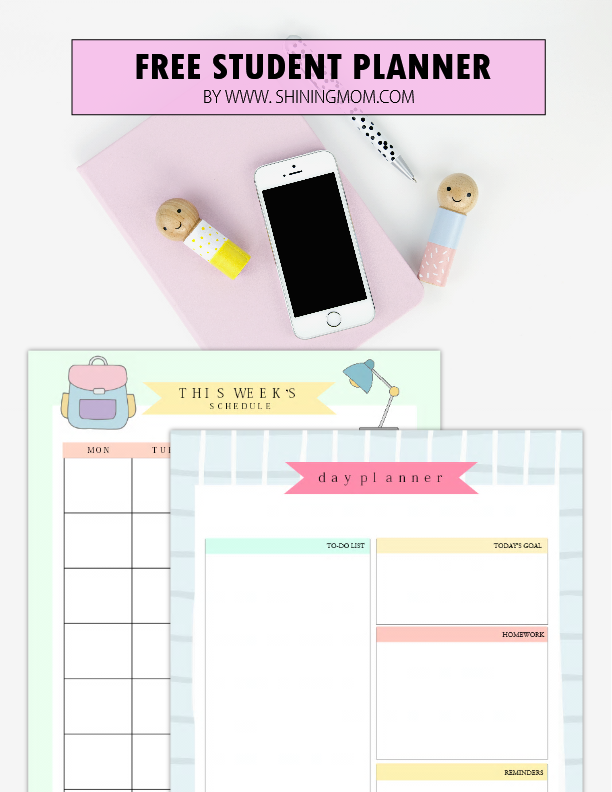 Just to be sure you can catch all the free printables released in Shining Mom blog, join my happy subscribers HERE! The Shining Mom tribe will be delighted to welcome you! Join the Shining Mom mailing list crew (you can unsubscribe any time) and receive weekly updates from the blog. Your membership also entitles you to receive the “Success Workbook” , an ebook designed to help you reach your ultimate life goals! « Free Printable 2018 Calendar: Pretty and Colorful! This seems like a really cool and time managing tool. I hope it works!!! Thanks, Gabby! I believe it will. Make it work for you. =) Good luck! mam i am from India and my name is madhu…i found that student binder would help me lot in my studies….so please send me the pdf file….i have already signed up for the newsletter but i got success work book but not the student binder…..so i request you to send me…..i would also share my experiences with you…. after i print them and use them……. and also suggest me how to study effectively and use the prints better waiting for your reply……. This is so great for me! I’m starting my senior year and I just found the perfect binder for me! Thank you so much! Godspeed! You’re most welcome, Harrie! God bless you! It will not let me print the document. I signed up for box and it still doesn’t work to download. Everything should be working properly now. It was a server quota issue. I had it fixed immediately. Thanks for the heads up. Enjoy the planner! This looks like such an amazing planner! Unfortunately, when I try to download it, Box says that they can’t find it. Hi, Erin! It should be working by now. It was a server issue. Enjoy the planner! Cheers! This is so awesome that you got this free for us to use! I’m so happy I found your website. I’m an early childhood ed major (who will be downloading your teacher binder, as well!) with one more semester of school to go and didn’t want to go out and buy a planner for the entire academic year. I love the project planner page in particular. That will really help with organizing my final senior projects and practicums, not to mention save a broke college girl some money. Thank you so much for putting these printables together! They’re very thorough and super cute! A lot better than many of the $50-$60 planners that I’ve seen 🙂 God bless! I am Sam from Belgium and I’m trying to download your binder but one way or another it doesn’t work. Is there something I’m doing wrong or maybe this doesn’t work because of where I live? Hi, Sam! The links should be working wherever you are. You can shoot me an email so I can help you out with the file if it links don’t work from your end. Cheers! How do I download the student binder? Thanks, Claudia! Enjoy the planner! I am unable to download the Student Printables. It is sending me to a blank cite. Is there any other way I can recieve them? I have double checked the links and they’re working properly in my end. Please try again. Thanks! your design is so pretty and cool! i hope i can get one ofthis!thankyou ? You’re most welcome. Plese enjoy the bindder! I’ve been using your printable calendars ever since, and you create the most unique designs! I hope that you make a complete 12 month calendar. Kudos! Thanks for your kind words, AJ! Hey! When I click the link it directs me straight to a blank page (https://app.box.com/s/r0c3ti67zf3hxgxayv8jsvi4f92ade9a). I’m working on a MacBook, can this be the issue? It’s working perfectly at my end. Please shoot me an email at khaye@shiningmomblog(dot)com. I’ll see what I can do to help you. Ugh this is just what I needed! As a busy student (and mom) organization in my life is key to make things function properly! I did want to ask if there a way to get this to fit a personal sized planner? Or is it only available on letter size? This planner is in letter size! You can definitely use it to keep you organized. I hope it will be useful for my study.. Thanks so much, Fika! Please enjoy the binder! I am glad you like it, Charlotte. Please enjoy the student binder! I can’t believe how kind you are ! Thank you so much for your help ! !